Michael Todd products are made with certified organic ingredients. They are also free of parabens, sulfates, synthetic fragrances, or artificial dyes. Therefore, when I heard that they had a Antimicrobial Sonic Skin Cleansing System, Oma was intrigued. Sonic skin cleansing is credited with improved skin tone, reduced breakouts and blemishes, better absorption of moisturizers and serums and overall better cleaning than with hands alone. 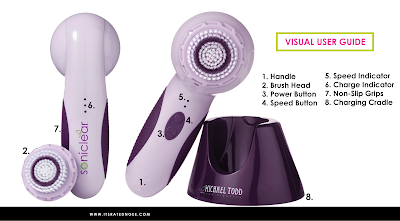 The Soniclear, the World's First Antimicrobial Sonic Skin Cleansing System, micro-massages away dirt and impurities. Then it protects itself from microbial contamination! The brush is treated during manufacturing process providing 24/7 protection against stain and odor causing bacteria. A cleaner brush equates to cleaner skin. In the box, you will find a Soniclear Device; a Facial Brush Head with Cover, a Body Brush Head with Cover, a Charging Stand, and a Charging Cord. The Soniclear is waterproof and can be used in the shower! It is ergonomically designed and balanced for effortless cleansing and maximum control. The Universal Charging and Storage Cradle is convenient for storage and recharging between uses. Lastly, a Two Year Warranty means years of trouble free enjoyment. This unit is a pretty purple shade and looks great on Oma’s counter. After a quick charge, Oma used the smaller brush on her face. This unit has an Automatic Cleansing Timer that gently reminds you when it’s time to move to another area of the face or body.